Gold, silver, platinum and palladium are rarely used in their purest form but instead they are normally alloyed with lesser metals in order to achieve a desired strength, durability, colour etc. It is not possible to detect by sight or by touch the gold, silver, platinum or palladium content of an item. It is therefore a legal requirement to hallmark all articles consisting of gold, silver, platinum or palladium (subject to certain exemptions) if they are to be described as such. The main offence under the UK Hallmarking Act 1973 is based on description. It is an offence for any person in the course of trade or business to: Describe an un-hallmarked article as being wholly or partly made of gold, silver, platinum or palladium Supply or offer to supply un-hallmarked articles to which such a description is applied. What needs to be hallmarked? Any article described as being wholly or partly made of gold, silver, platinum or palladium that is not covered under exempt articles. Main Exemptions: Articles below a certain weight are exempt from hallmarking. The exemption weight is based on the precious metal content only, excluding, for example, weight of diamonds, stones etc, except in the case of articles consisting of precious metal and base metal in which case the exemption weight is based on the total metal weight: Platinum 0.5 grams Gold 1.0 gram Palladium 1.0 gram Silver 7.78 grams. Any pre-1950 item may now be described and sold as precious metal without a hallmark, if the seller can prove that it is of minimum fineness and was manufactured before 1950. This is the unique mark of the company or person responsible for sending the article for hallmarking. The sponsor may be the manufacturer, importer, wholesaler, retailer or an individual. 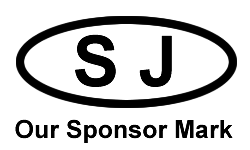 To obtain a sponsor’s mark you must register with an assay office. This shows the fineness of the metal – ie purity of the precious metal content in parts per 1000 in relation to the standard recognised in the UK. 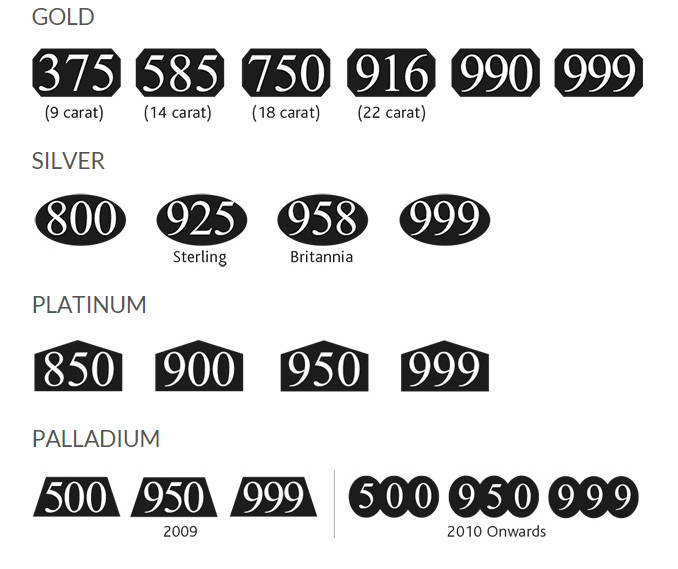 For example 750 parts per 1000 by weight is equivalent to the old 18 carat gold standard. The alloy must be at least 750 parts per 1000 to be marked as such. There is no negative tolerance. This symbol shows which Assay Office tested and marked the item.